This is a book that is less concerned with the plot than it is its characters. I like this. The plot will move when it’s ready. It has to, especially in non-fiction, but characters take time, require an understanding and ability to read people that is rare and even harder to convey properly in writing. These are things that Parry does very well. He delves into mid-90s Tokyo, rebuilds it brick by brick into a microcosm of the world Lucie Blackman inhabited as well as the one that sprang up after her death. He explores every angle, embraces every twisted aspect, and does so in surprisingly well-crafted prose. This is how you get me to read non-fiction. Don’t give me facts, give me people, give me characters I can hang these facts on. What some may like and other despise is the fact that there are no clean answers. We are given all of the sordid details of the murder, but in the answers, in the how, and to some minds even the who, there are no certainties. It is as messy and corrupted as any human endeavor and Parry makes no attempt to disentangle it or declare himself incorruptible. From Lucie’s parents, to her friends, the Tokyo police force, and even the whole of the gaijin district of Rippongi, each is examined at length and with a cautious affection. The books primary concern lies in the investigation, the failures, successes, the escalation of a missing person’s case to a national controversy, and the culture that influenced each in turn. You might rightly be asking yourself why the book is titled The People Who Eat Darkness. It seems a catchy title with a tenuous application to the topic of the book. And you’re right. There is no shortage of darkness on which to feed; selfishness, perversion, sexual and not, and a tragedy sitting like some giant sun right in the middle everything. This bothered me at first. I kept waiting for an answer to clear itself from the brush of the investigation and deliver me into the arms of some kitschy but ultimately vapid tie-in. But by the time I’d finished, once I’d realized that I’d taken in, relished some 400 pages that delved into the personal details, failures, and hauntings of a long dead 20-something and the facts surrounding her family, friends, and murderer, I couldn’t shake the feeling that that only thing eating darkness was me. 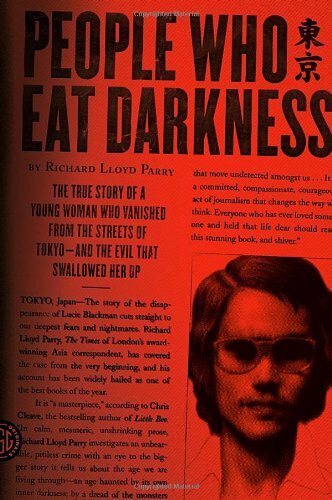 This entry was posted in Book Review, Nonfiction, Review and tagged crime, Japan, journalism, Lucie Blackman, murder, mystery, People Who Eat Darkness, psychopaths, Richard Lloyd Parry, Rippongi, tokyo, true crime. Bookmark the permalink.